A view showing the front of the Parknabinnia Wedge Tomb on Roughan Hill in the Burren, Co. Clare. Cairn material is visible on its roof. 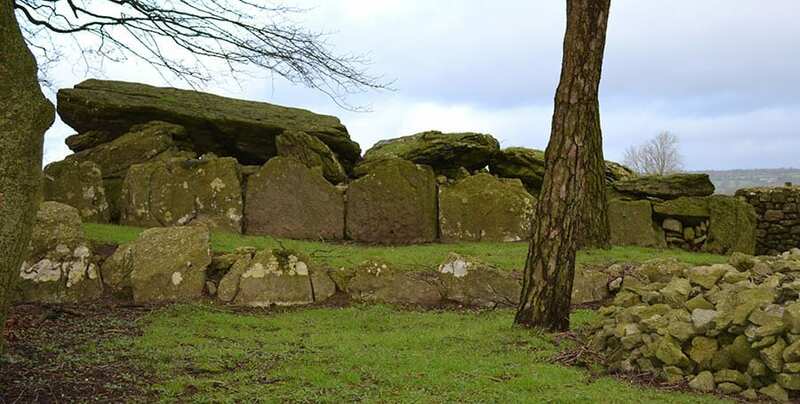 Neolithic Wedge Tombs are a type of Megalithic Monument peculiar to Ireland, though they do bear some similarities to Brittany’s distinctive ‘gallery graves’. This may indicate that broadly similar burial traditions travelled north from ancient Gaul to Ireland. This type of Megalithic Monument was built (alongside Standing Stones) as the Neolithic Age drew to a close and began to segue into the Copper Age (circa 2500 to 2000 BC). There are more than 500 in Ireland – roughly one quarter in County Clare, one quarter across the south-west of the country. The rest dotted about throughout the west and north-west. Many were found to contain the remains of pots made by the Beaker People. These tombs fall into the category of chamber tomb and take their name from their shape, as they taper towards the end. They are constructed with side walls made from several upright stones arranged in order to support the large roof slabs, resulting in a chamber that is open at one end (some also feature a connecting antechamber). The entrance of these tombs were planned so that they faced in a south-westerly or westerly direction – so towards the sunset. The main structure would originally have been covered by a cairn (a small oval or round mound). Today, the cairns have eroded to nothing, leaving only the main box-like structures visible. Such tombs are typically located around three-quarters of the way up a steep hill or mountain. Both cremated and intact human remains have been found in tombs of this type, though cremation seems to have been more common. Beaker pottery and flint tools were also often placed in the tombs, though this was not always the case. Over time, these monuments would have become an integral part of the landscape and a focal point for the communities that lived around them. Wedge tombs are something of an anomaly in terms of tomb design across the rest of Ireland and also Scotland, Wales, England, and continental Europe. In these areas there is evidence that burial traditions had evolved from internments involving multiple bodies towards a preference for single-person graves (called pits or sometimes cists). The settlements and communities in the west of Ireland clearly favoured this design of tomb. Perhaps they were influenced by the collective burial rites practised elsewhere in the world in grand structures, including – dolmens, court tombs and passage graves. One unanswered question is why the settlements in the western regions chose to stick to this older tradition. The rest of Ireland and surrounding countries had moved towards a preference for single burials. It most certainly was not because western Ireland was out of touch or unconnected with the larger world. Indeed, Beaker pottery that would have been regarded as positively cutting-edge in those times has been unearthed in many Irish tombs. This rules out any possibility that the area was in any way geographically or socially isolated. Such pottery was made by a nomadic people who lived in the later Neolithic Age and at the start of the Bronze Age (circa 2700-1700 BC). They take their name from the beakers and pots that were buried with them. These astonishing pots have been discovered at ancient sites right across Europe – a reflection of both trade and the migratory tendencies of these mysterious ancient people. One theory often put forward to explain this tomb phenomenon is that the societal structure was not hierarchical in the west of Ireland as it was elsewhere in the Europe during the 3rd century BC. At some point during that century, a shift occurred that led to more influential members of society desiring to be laid to rest with more pomp and ceremony. In other words, in their own personal cist, surrounded by objects that denoted their prestige and high ranking in their community. It is possible that burial styles really did underpin notions of the pecking order in ancient communities and could also have helped to clearly establish the right of the deceased individual’s descendants to assume a similarly high status. 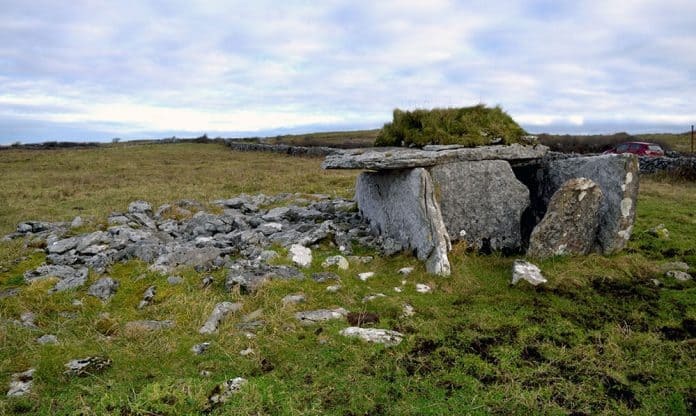 If this theory is correct, it would seem logical to assume that these tombs so associated with the west of Ireland reflect a society that had slightly different preoccupations and a less linear societal structure. Such communities may have been considerably more liberal and democratic. Why this was the case is even harder to know. Was there a resistance in the west to the progress of paganism? Was there a schism whereby the east and north of the country bought into more quintessentially European beliefs? Did the western folk have a different sense of cultural identity that they were determined to cling on to? The Labbacallee Tomb in County Cork is the largest example of the Wedge Tombs in Ireland. This tomb was the first such Neolithic Megalithic Monument to be properly archaeologically explored. The investigations turned up body parts of multiple people – perhaps most remarkably those of those of a headless woman. Another superb example of a Wedge Tomb is the Parknabinnia one located in the Burren district of County Clare. The Burren is itself an area notable for its impressive number of megalithic structures, some of which contain the remains of Beaker People pots. Labbacallee Wedge Tomb near Fermoy, Co. Cork. Despite all the mystery surrounding these enigmatic structures, one thing is clear: the disparity between the west of Ireland and its Neolithic Wedge Tombs (many of which contained relics from the Beaker people) and the style of Megalithic Monument found across the rest of the country and Europe was most pronounced. The way in which a society chooses to deal with its dead is pivotal to its sense of identity, its structure and its organization. We can therefore conclude that Wedge Tomb communities had a very different perspective to both life and life after death than their neighbours – both near and far.